Technical notes, Tinkercad/educator flavor: If you are supervising students who are personalizing this design in Tinkercad, I highly recommend having your students use the Ruler tool. To do this, select the Ruler from the "Helpers" section of the right-hand menu column in Tinkercad, and put the Ruler down anywhere on the Workplane (preferably somewhere out-of-the-way, maybe in a far corner). When the Ruler is on the Workplane, any object you select will have dimensions that you can modify by typing into the number fields. To personalize this object, first Ungroup it and remove the CGR initials. 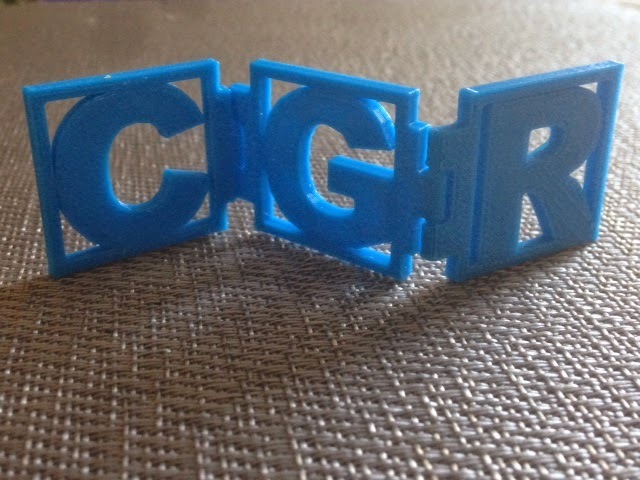 Put down letters from the right-hand Tinkercad column and resize them to fit in the boxes. Then use Adjust/Align and the arrow keys to get everything lined up just right.